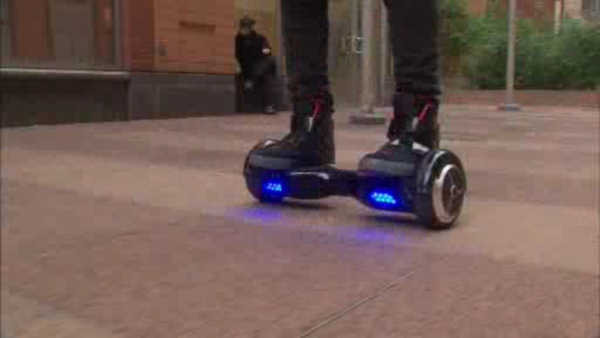 LOS ANGELES (KABC) -- Hoverboards and other self-balancing electronic devices will not be permitted aboard Metrolink trains beginning Monday. Metrolink confirmed on its Twitter page Wednesday that the new restriction will not allow passengers to operate or transport the devices starting Jan. 4. Effective Monday, 1/4/16, passengers won't be allowed to operate/transport hoverboards or any self-balancing devices on board trains. "This is a proactive step we've taken to ensure the safety of our passengers," Metrolink spokeswoman Sherita Coffelt told City News Service. "There have been concerns voiced about these devices catching fire and blowing up, and until there are more studies done, we're not going to allow them on the trains," she added. Coffelt said Metrolink officials made the decision last week following informal discussions, although she confirmed there were no reported injury accidents involving hoverboards and other self-levitating products on Metrolink trains. "We just felt it was prudent to take this action now to prevent anything from happening," she said. Coffelt said that if passengers board trains with their boards, Metrolink personnel will ask them to step off, but the devices will not be taken away. "They may not be able to ride," the Metrolink spokeswoman said. "We'll try to work with them and give them the option of returning to take another train."